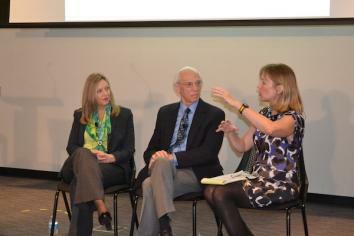 Future of Longevity event recap: Longer lives mean retirement challenges, new family dynamics. Get comfortable in that office chair, because traditional retirement at the age of 65 is rapidly going extinct. That was the prevailing message of “The Future of Longevity,” a Future Tense event held Friday morning at the Washington Post building. Economists, policymakers, and culture watchers gathered to discuss how life extension—even beyond what we have achieved so far—could change everything from marriage to the GDP. Maybe dramatic changes in longevity aren’t just around the corner, but at Future Tense, we believe that it’s important to discuss transformative technological and scientific changes early and often. As my colleague Laura Helmuth has chronicled on Slate, life expectancy in the United States has doubled in the last 150 years. But what if we were to improve on that still more, whether through personalized medicine, genomics, nanotechnology, or some other breakthrough? A recent Pew survey found that Americans are wary of living to 120 or beyond, but William Saletan explained in Future Tense that a bias likely skewed those numbers: When we think of old age, we think of bodies and minds breaking down. But if we could live to 120, 140, or 150 and spend those extra years in good health, you might welcome the opportunity to get to know (and even roughhouse with) your great-great-grandchildren. So let’s assume that we could indeed age gracefully, and more slowly, together. What might that look like? Family reunions will get much, much bigger. During his opening remarks, Slate Group Editor-in-Chief Jacob Weisberg joked that we might need to think about what we would call the 100th anniversary—the plutonium anniversary? But in the first panel of the day, Chris Hackler, the director of the Division of Medical Humanities at the University of Arkansas for Medical Sciences College of Medicine, proposed that the idea of a century-long marriage might be radioactive. “How many people really want to stay married for 100 years?” he asked. Instead, we may see a rise in serial relationships: In your long lifetime, you might have three or four serious romantic partners. That’s because while marriage used to be for procreation, it’s now for happiness—and he suspects that the same person won’t make us happy during such a long life. As life has gotten longer, we’ve seen the age of marriage and first child rise. Today, however, women can put off having children for only so long. But what if we could delay or even eliminate menopause? Sonia Arrison, author of 100+: How the Coming Age of Longevity Will Change Everything, From Careers and Relationships to Family and Faith, has thought hard about what might happen if advances that slow the aging process can also allow for extended fertility. Serially monogamous women might have children with each of their partners—maybe one child at 25 and then another at 70. That would radically alter sibling dynamics. What’s more, Hackler added, it could mean growing up with as many as dozens of grandparents, great-grandparents, and great-great-grandparents. That would undoubtedly require a rewrite of the etiquette books, he said. We’ll all have to count our pennies more wisely—and expect more working years. And that’s going to be quite a challenge: According to Lisa Mensah of the Aspen Institute’s Initiative on Financial Security, “half of the workforce hasn’t been amassing private savings.” Stashing your cash instead of going on an Amazon shopping spree is important, of course, but this isn’t just about lecturing people about personal responsibility. Mensah emphasized that we need to shore up the safety net. “Many workers, no matter what class, are still counting on a robust Social Security system,” she said. “But everybody, even that greeter at Wal-Mart, wants a private saving system to build on top of Social Security.” Mark Warshawsky of the Federal Commission on Long-Term Care agreed that Social Security is an “important base,” but argued that the program is “old-fashioned,” reflecting a ‘30s view of marriage and retirement alike. It needs to be updated, he said, to reflect what’s already happened to our lifespans and working lives, much less what’s to come. Jamie Kalamarides, a senior vice president at Prudential Retirement, noted that depending on the estimate you use, just 25 percent of small businesses offer workplace-based savings plans—and that’s particularly problematic because small-business employees tend to be women, people of color, and low- to moderate-income earners. (Disclosure: Prudential sponsored the “Future of Longevity” event.) He envisions new policies that would make it easier and more affordable for mom-and-pop operations to offer savings plans. Kalamarides and Mensah agreed that the key to helping people save for retirement is to make it simple and automatic. If you have to opt out of payroll deductions to retirement accounts, you’re much more likely to accumulate funds. We need “defaults so that people avoid making mistakes,” said Kalamarides. The day’s speakers were unanimous that retirement at 65 is a thing of the past. But as many pointed out, it’s easier for office workers to keep working into their gray years (death by swivel chair notwithstanding). If you do physical labor, even medical advances might not make it safe or possible to stay on the job into your eighth or ninth decade. Furthermore, as Arizona State University’s Michael Birt noted, variability between people increases with age. There are “old” 65-year-olds and young ones, too. (Arizona State is a partner with Slate and the New America Foundation in Future Tense.) But there are solutions to explorel: Wilhelmina Leigh of the Joint Center for Political and Economic Studies suggests that we should expand the way we think about retirement. More workplaces ought to allow for flexible retirement, she says—maybe you only go in to work three days a week, and your benefits and salary are prorated accordingly. That would allow people to participate in the workforce without costing them their health, especially if they have physically demanding jobs. So if people are going to live longer, the nuclear family as we know it may be over, and retirement funding will create headaches. But there’s good news: Longevity is good for the economy. Really, really good. Over the 20th century, cumulative gains in life expectancy were worth over $1.2 million per person for both men and women. Between 1970 and 2000 increased longevity added about $3.2 trillion per year to national wealth, an uncounted value equal to about half of average annual GDP over the period. Reduced mortality from heart disease alone has increased the value of life by about $1.5 trillion per year since 1970. The potential gains from future innovations in health care are also extremely large. Even a modest 1 percent reduction in cancer mortality would be worth nearly $500 billion. Not too shabby. In other words: “All the improvements in computers and communications and everything else, totaled up, is roughly the same or even a little smaller than what we’ve gotten from increased longevity,” they said during their presentation. As long as we can keep advances in health care within reasonable limits, we’ll see still more value. Too often, said Lisa Mensah, people don’t really think about retirement until they’ve experienced their first slipped disc. But if we start thinking about it well before, then growing older—however it happens in the future—will be a lot less painful. “Drooling on Your Shoes or Living Long and Prospering? Four visions of our future lifespans,” by Joel Garreau. “It Takes a Village, Part II: How to support the coming boom in the elderly population,” by Michael Birt.